I’ve been thinking about the colour scheme for my UCM this week. Initially i quite liked the idea of a khaki and black scheme or an urban camo of some kind. Each time I looked at examples though I kept coming back to the green scheme in the book. It contrasts well with the typically greys of the roads and buildings found in the game and looks like an uncomplicated futuristic military. I also invested a lot of time in various shading and highlighting on my PHR, but at this scale it simply isn’t terribly appropriate or visible. For all these reasons I’ve decided to go with an unfussy plain green scheme. 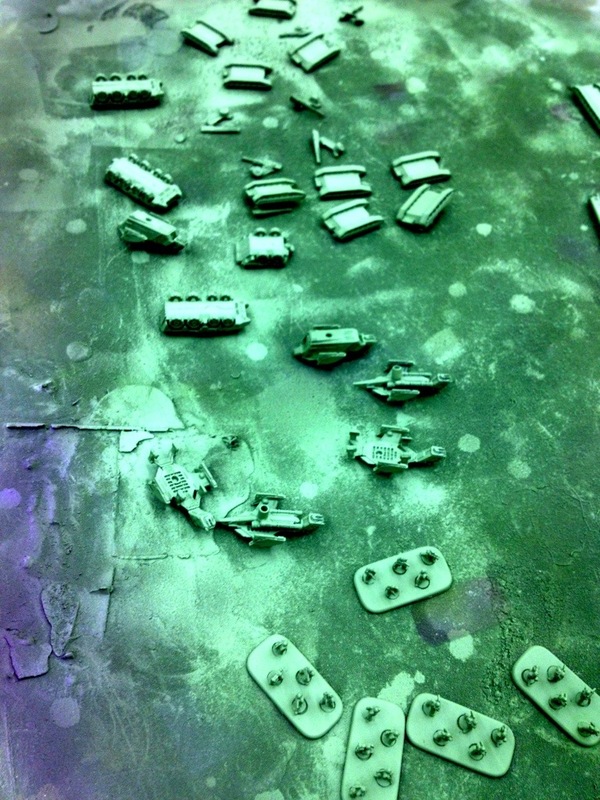 I gave all the models a spray of Army Painter Army Green this evening. Next I plan to paint in the metallics then I will give them all a fairly heavy wash of some kind to darken the green, shade the recesses and add a bit of dirt.